On this tour, we were accompanied by our friend Ariane Chesaux, who lives in Brussels. 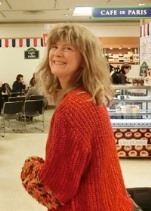 Bohemian and free-spirited, she works on healing and relaxation with percussions, sounds, bells, singing bowls and movement. Before the tour, we were open for anything to happen! 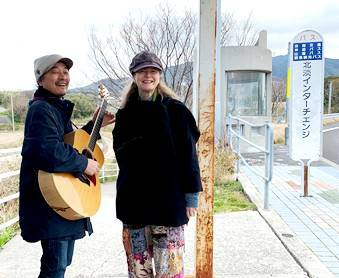 We arrived on the island of Awajishima in the morning and rehearsed while waiting for the bus. 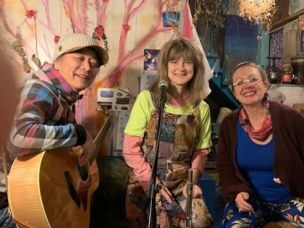 We were very happy to support organic products and this little community called Nijinowa, playing our songs in this organic market. It was the first time we played our songs with Ariane and she wrapped them in her acoustic soundscape. 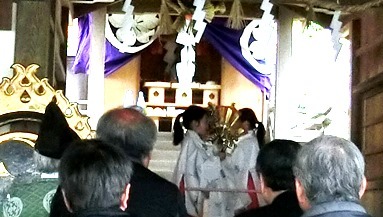 We went to see a beautiful dance of young ‘Miko’ in the sanctuary next to the old school. 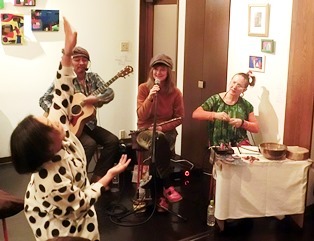 It was the first time Bix did a reading in Japanese of a short-story she had written, translated by Tsubaki Riyo. Ariane read it in French, while illustrating it with her sounds. 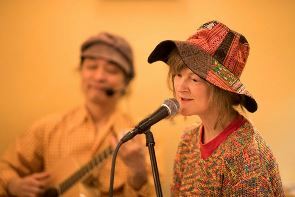 The rehearsal that Ariane and Bix had in the train from Kyoto to Kobe worked out very well. The weather got warmer than the previous days. Ariane created her sounds and danced to our music. Two students came to see us and they said that they hadn’t heard acoustic instruments being played for a long time. Frenchman Philippe’s bar was welcoming and artistic as always. He and Ariane spoke French together and there were French, American and Japanese people in the audience. The mix of cultures made the bar's atmosphere more relaxing ! We chose mostly soft and slow songs to play with Ariane, while people had dinner. We met wonderful people who all listened to us in deep silence. A nice picture taken by Alim, one of the brothers who run the restaurant and the shop. She danced in between the tables. In the express train going to our next destination : Shikoku, eating the train lunch-bento ‘Ekiben’ ! 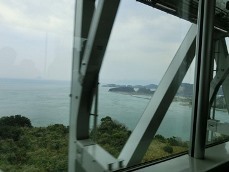 We had been many times to Shikoku but it was the first time for us to cross the 13km long bridge. We love to come to this wonderful, creative place filled with works of art and of objets that is Kuu Shokudo, which means Kuu’s little restaurant. Our music goes very well with the energy of the place. Kuu invited us to sleep on the 2nd floor of the house, in a tatami room where she had prepared futons, tea, snacks and towels. So nice of her! There are paintings of hers all over the walls upstairs. A fairy-talish night ! The Imabari duo Bekka played two songs, as they did last time too ! We love to play the same evening as other local artists. 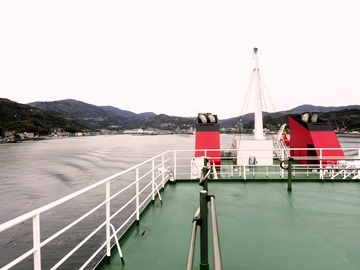 Here we left the island of Shikoku for the island of Kyushu. During the tour, as always, Bix worked on sorting out pictures and upload on FB to comment our tour every day when possible. Here on the ferry boat. 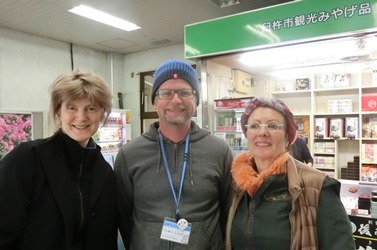 When we arrived to the little port of Usuki, in Kyushu, we met Heimo at the Tourist Office of the town. He is an organic farmer in Usuki and originally comes from Austria. He would like to organize a concert for us in Usuki the next time we come ! That would be great. There were French speakers in the audience… How nice that everybody start dancing at the end on the butterfly song ‘ Papillon migrateur’ … liberated by the mysterious sounds of Ariane’s singing bowls, her scratching the paper and amplifying it to our melodies. After the concert, the owner of Wam Am invited us to a fabulous dinner, all together. It was our 8th time at Café Brassens and we are always so happy to play there. This time Ariane danced in between books, our music and paintings on the walls. The reading with Bix called ‘The tent’ was read every night and here too. It was a little link to the lyrics of the songs, which often are about a meeting, a fragility, the search for a home, a silence. A lady in the audience told Mr. Sonoda that she felt spirituality, something between Shinto, Buddhism and Christianity in our performance. We felt that too! Inspired by Ariane, Bix danced too. We had a day off in Saga the next day. 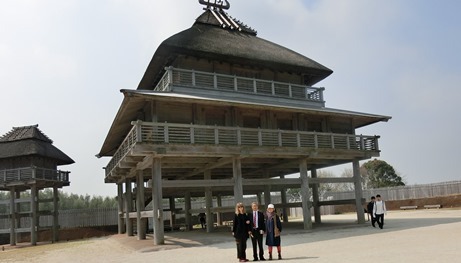 While Marki gave a guitar lesson, Ariane and Bix were invited to go to see the Yoshinogari historical site, with its ditches and reconstructed houses from the Japanese Yayoi period, 2000 years ago. 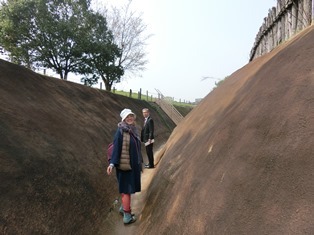 It is incredible that they had such warehouses on pilotis at that time, in the Yayoi period. 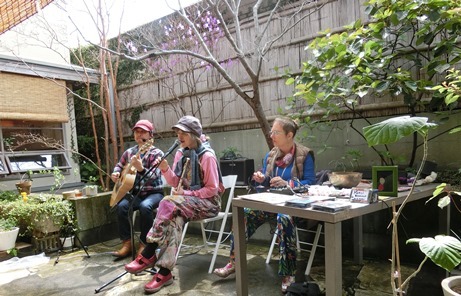 We played on the terrace, in the garden, on the 2nd floor of a design and architect office. It was such a pleasure to have fresh air, nature, organic food and beautiful tableware. 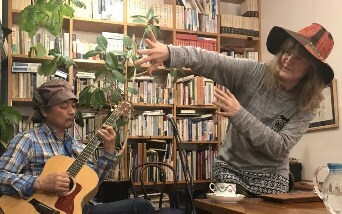 Last time we played in Kumamoto was in the restaurant Dorobushi which owner wanted more quietness and nature and became the chef of this gallery-café instead. We loved it. It looked like this from inside. Vibrations with the bowls among the audience, in the open air. We played for babies and their Mums. 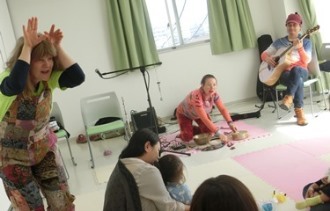 Thank you so much to Miho and Souichirou who often organize events in Oomuta, for us and the Happy Mama Project. 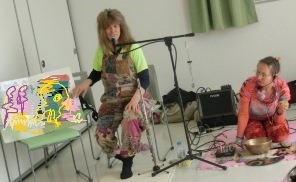 Doing a children book reading (a Japanese book in French), illustrated by our sounds and music. Bix danced as a rabbit. Ariane among Mums and babies laying down in total relaxation. 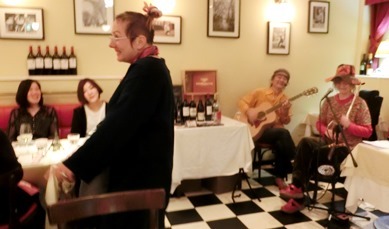 In the evening we played at the Daifuku restaurant, at the Bar Sakura event. Bar Sakura is a monthly meeting between freelance workers etc. to meet other people and create contacts and projects in the city. We were meeting people, chatting and eating. Everybody brought drinks and food and this kind of concept is apparently in the wind in Fukuoka Pref. 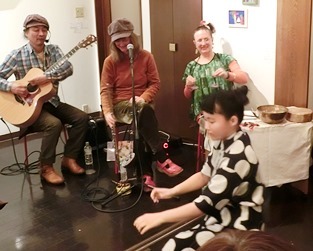 Daifuku was so kind to accept the event and our concert. Kanna was a waitress on that evening, and suddenly she started to dance... she is actually a contemporary dancer. Together with Ariane’s sounds and our music people started obviously to feel free and excited. 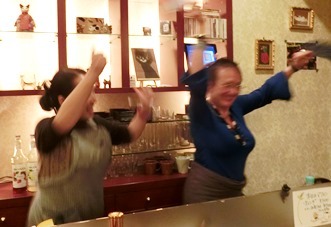 The owner herself, Chiho san, started to dance too. 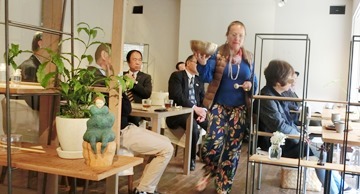 She is a great contemporary dancer, Bix knew her and had performed with her 20 years ago in Kyoto... The audience stood up, shouted and laughed. Mori no Kyujitsu wraps delicious food with art, music and dance … that is soooo nice. This was the last concert we played with Ariane in the tour. We developed little by little a way of playing, with an upcoming feeling of freedom. We played the last concert of this tour in the French Week of the dept store Hankyu, in Senri, Osaka. We were a little sad not to play with Ariane, but felt that playing for and with various people in different places is a pleasure that opens up to new horizons. It was still a new event in that place and we noticed that our concert was surprising for people, in a positive way. Here at the Café de Paris stand. We played in a corner, so people who wanted to listen to us could sit down and do so. Bix had a Spring cold during the trip but now she was doing very fine. 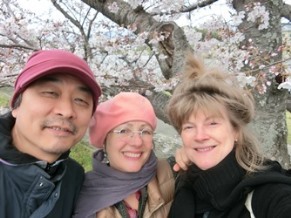 We met Ariane for the first time at the birthday party of a common harp player friend, in 2000 in Brussels. 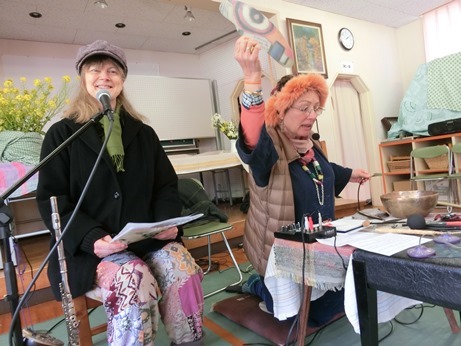 Ariane was interested in Japanese acupressure - Shiatsu, and flower arrangement - Ikebana. In Brussels we organized Japan-Brussels parties together, also in connection to our (Bix & Marki) school. Ariane developed little by little her sound world of vibration, healing and freeing noise. 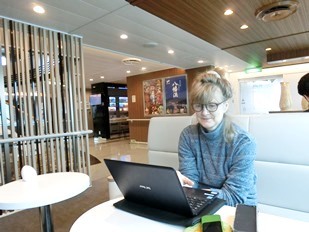 This trip was her 2nd to Japan. 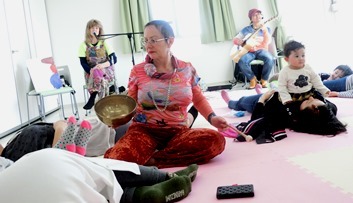 She came with her bowl and bells and it became a creative challenge to put our songs together with her soundscape. We really think that Ariane managed very well to play in unknown places, for unknown audiences speaking an unknown language almost every night for these 2 weeks of the tour. Let’s play again another time, Ariane, and thank you to you all for having followed us on our Spring Tour 2019 !